Lemon Harangue Pie: Expert analysis: Could the eagles have flown Frodo into Mordor? 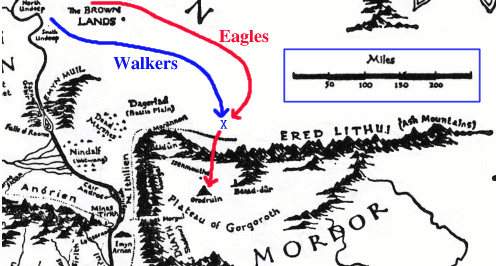 Expert analysis: Could the eagles have flown Frodo into Mordor? Everyone who has seen the movie or read the book has asked themselves the same question: Why didn't the Eagles just fly Frodo into Mordor and save him from the perilous journey on foot? If the Ring's destruction was absolutely necessary to save the world, then sending a Hobbit on what was sure to be a long, drawn-out suicide mission wouldn't be my idea of a winning strategy. After the Council of Elrond, but before the Company departs from Rivendell, Gandalf goes up to the Misty Mountains, hails the eagles, and discusses the matter with them to secure their cooperation and to coordinate the plan. The Grey Company travels as they did in the text, passing thru Lórien and traveling down the Anduin on boats. At some point on the Anduin, the company lands on the east bank, abandons the boats, and travels on foot north of the Emyn Muil thru the uninhabited Brown Lands. They then turn south and end up at some point along the Ered Lithui around a hundred miles east of Cirith Gorgor, directly north of Mount Doom on the north side of the mountains. The eagles rendezvous with the company at some pre-arranged spot just north of the Ered Lithui. It's likely that Aragorn (or someone else) would have previously traveled in the Brown Lands and would be able to designate some landmark as a suitable meeting place. An eagle carries Frodo to Mount Doom in a single flight, possibly accompanied by other eagles and by other members of the Grey Company. Frodo goes into Sammath Naur and throws the Ring into the Cracks of Doom. My contention is that there is nothing in the text to rule out such a plan, and that it is simply a hole in the plot of an otherwise excellent book that the issue is never brought up. This is not to say that LoTR is in any way a bad book; it merely shows that even as excellent a writer as Tolkien does not always succeed at perfectly harmonizing the various entities which he has placed in his world. He goes on to address 12 objections one might raise in defense of the story as originally penned by Tolkien. If you're in a geeky mood, it's well worth the read.